Here is no doubt in this fact that the Indian states are moving fast with the movement of Make in India Scheme. India has emerged as the leading FDI destination after crossing the neighboring country China. It attains an advanced position on the ease of doing business. Indian Startup Industry has also registered an enormous growth with the easy availability of low interest business loans. In addition to the loan obtainability, Indian states are inviting the national and foreign investors with many more prospects. Competition acts as a growth element when it takes place inside a class or a country. Driven by its inter-state competition, India is going higher in the ease of doing business. 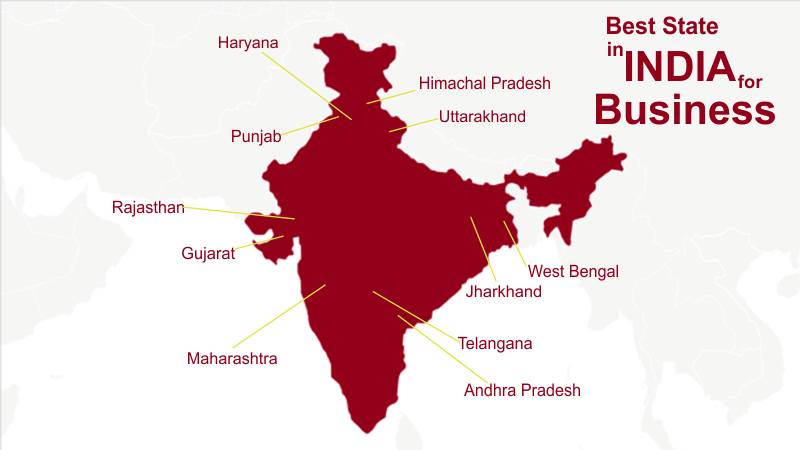 A question arises here – why Indian States are gradually turning better business territories? Let’s have a little picture on the top scoring states with their strength areas. In 2014-15 FY, Telangana scored the 13th position, but it shows immense growth in the ease of doing business as it overcomes the leading state, Gujarat, in the current year. After crossing the border of second position, another South India state Andhra Pradesh has been able to score equal points with Telangana. Gujarat has registered as the third territory of Indian Business. This list followed by Chhattisgarh (4th in 2014-15 FY), Madhya Pradesh (5th in 2014-15 FY), Haryana (6th in 2014-15 FY), Jharkhand (3rd in 2014-15 FY), Rajasthan (6th in 2014-15 FY), Uttarakhand (23rd in 2014-15 FY), and Maharashtra (8th in 2014-15 FY).